Friday is the Longest Day and the Northants Telegraph will be capturing every moment on video – but they need your help. They’re looking for as many readers as possible to capture something, anything, that they see or do on the day. It doesn’t matter what pictures or video you take. It could be sunrise, sunset, the chaos of family breakfast, the pretty afternoon walk or summertime fun such as a barbecue. It should provide a great look at how we live our lives. So, get your cameras out and help Northants Telegraph paint a picture of the county at work, rest and play. To take part, just email your pictures and video. You can also tweet your video using the twitter hashtag #longestlocalday. Northamptonshire County Council and Amey have launched a scheme to encourage community groups and schools to compost. Amey, formerly Enterprise, the company that runs Northamptonshire’s Recycling Centres, has donated 5 tonnes of top quality peat free, recycled compost to the Community Composting Project run by the waste management team at County Hall. The compost is being given out to Pocket Parks, Schools and Allotment Groups all over the county. If you represent a group and would like to claim 5 free bags of compost please contact us. Limited supplies are available. A number of Pocket Parks have already claimed 100kg of top quality compost for various small projects. Syresham Pocket Park, Great Billing Pocket Park, Hackleton Pocket Park, Warmington Pocket Parks and Boddington Jubilee Field have all received free compost. Our friends at Pocket Farm have got us thinking about adoption, but adoption of the feathered variety. Their recent article on adopting ex-battery hens provided useful information and websites in order to try your hand at some very rewarding hen keeping. One thing about ex-battery hens is the sorry state you can find them in, few feathers can mean they get the chills if temperature drops. Therefore we have a useful knitting pattern, if you’re feeling crafty, for knitting a Hen Jumper! If you’ve read the Pocket Farm article and want to adopt but not sure about the knitting, they can be purchased ready made from ‘Knits by Sue’ for the excellent price of £3.50 per jumper (unusual or hard to find colours may cost more). Contact ‘knits by Sue‘ to inquire and order. 1/ cast on 10sts @ beginning of row. K14. P to last 4 sts. K4. 2/ cast on 10sts @ beginning of row. K to end 3/ (K2. yf. K2tog) 3 times. K2. P33. K14. 4/ (K2, yf. K2tog) 3 times. K to end. 5/ Cast off 10sts. K3. P33. K14. 6/ Cast off 10sts.K3. K2tog. K to last 6 sts K2tog. K4. Dec. I st at each end on every following 6th row until 25 sts remain, keeping edges in garter stitch. Work 11 sts. cast off 3 sts work to end and complete this half first. 2/ P1. P2tog twice P2. K4. 4/ P1. P2tog. P2. K4. Work next 4 rows straight. 10/ P2. Inc in next st. K4. 11/ K6. Inc in next st. K1. 12/ P1. Inc in next 2sts P2. K4. Put these 11 sts onto holding pin. Break yarn and rejoin to other side of neck. Work to match, reversing shapings and ending at wing hole edge. That’s row 13. Next row K4. P7. Cast on 3sts then from the sts on holding pin P7.K4. Inc I st at each end of following 6th row until there are 41sts on needle. Sew on buttons. Work I row double crochet round neck edge if desired. #Northantshour…..It’s the hashtag that’s taken the county by storm, with Thursday nights transformed into a hive of frenzied activity, and now #northantshour users have pledged to meet up for real. The Twitter phenomenon, which sees hundreds of local social networking enthusiasts connecting with each other for an hour every week, will now branch out into ‘the real world’ – with a planned meeting at a Northampton bar. Tweeters will gather at Wellingborough Road venue, and regular #northantshour contributor, Behind The Bus Stop at 7pm on Tuesday, June 25 – leaving their computer screens, iPads and mobile phones behind for a proper face-to-face chat. Social media expert Daniel Owens, a director of tweet-up organisers Orange Juice Communications, said: “The impact of #northantshour has been extraordinary. It has enabled local companies to do business with each other, it has brought people together and it has massively raised the profile of the county. The networking session runs from 8pm to 9pm every Thursday and involves businesses, residents and other local tweeters introducing themselves and ‘meeting’ new people from all walks of life across Northamptonshire. Its popularity has grown to the extent that it is now regularly a ‘trending topic’ in the UK every week – meaning it is one of the most tweeted about subjects in the entire country. Those regularly taking part include Northamptonshire Police, a county MP, a number of local restaurants, sports clubs, bloggers and media outlets (including your very own Nene Local) – as well as hundreds of avid social media users keen to find out more about what’s going on locally. Behind The Bus Stop landlord Paul Tyrrell said: “We absolutely love #northantshour and it’s really helped raise our profile. It’s great fun chatting to everyone on a Thursday night and we’re really looking forward to hosting what promises to be a superb evening. All #northantshour users have been invited to the tweet up. However, please notify @behindthebussto through twitter if you are planning on going along. Hardwater Mill in Northamptonshire will soon be generating power from the River Nene. 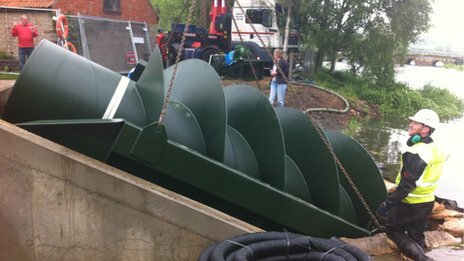 Work has already begun on installing hydropower technology so the mill at Great Doddington, near Wellingborough can produce power. The Mill will soon generate enough electricity to power itself and produce extra for the National Grid. Nene Local was told there are several other mills on the same stretch of river are also looking at producing energy too. The couple have set up the Nene Valley Hydro-electricity group involving 12 mill owners along the river. Another is Woodford Mill at Ringstead where the original water wheel has been restored to power a tea room, holiday lets and Willy Watts marina. OK so ‘miraculousness’ is a Nene Local specially made up word, but forgive us, in this instance the superfood deserves a whole new word! Local honey is gaining popularity as a ‘cure’ for the symptoms of hayfever. The theory goes that if the honey is from local bees, using local pollen then it’ll contain traces of the pollen to which you are allergic, I guess working on homeopathic theories? It seems to work for people we speak to anyway. Each jar of honey has its own explanatory label, informing you of the 55,000 miles flown by the bees as they were collecting pollen to make your honey, and the fact they’ve visited over local flowers up to two million times! We know why the saying talks about a ‘busy bee’ ! !